Herbal Medicine | Your Health. Your Lifestyle. Traditional Chinese medicine (TCM) dates back five thousand years. Unlike in Western medicine, where doctors focus on the body part giving you trouble, in TCM your body is seen as an integrated web of systems that can get out of balance, and health problems arise when your flow of energy, or chi, is blocked. TCM emphasizes healing with herbs, diet, Tui Na massage and acupuncture. Tai chi and Qigong are also closely associated. TCM uses the opposing forces of yin and yang as the fundamental way of understanding the body and health. Yin and yang represent dark and light, male and female, hot and cold. When yin and yang get out of balance, you get sick. 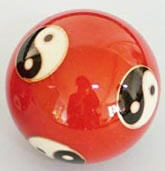 There are five different changing aspects within yin and yang, which need to be in harmony: Earth, Metal, Water and Wood. Each interacts with the other in a complex system. TCM can be helpful for many health problems, such as chronic pain, allergies, colds and flus, skin conditions, digestive problems, infertility and lack of energy. As part of the initial exam, the TCM doctor will check your pulse and look at your tongue. The color and shape of your tongue give the doctor an insight into the health of your internal organs, as each part of your tongue correlates to an area or organ in your body. Soothes and calms your stomach and entire digestive system. 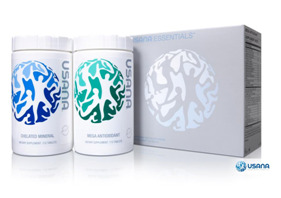 Promotes better digestion and provides antioxidant joint support. The Chinese first prescribed Ginger Root to relieve digestive distress as early as 3000 B.C. Today, Ginger is one of the most widely used spices in the world. Controlled studies indicate that Ginger may be more effective than modern medicine in alleviating nausea and vomiting due to motion sickness, surgery, or pregnancy. Why does it work so well? One reason is because Ginger has a gentle, relaxing effect on stomach muscles. This same relaxing effect also promotes heart and respiratory health by relaxing the muscles around blood vessels. Ginger also eases gas and bloating, and stimulates beneficial digestive juices because it contains powerful protein-dissolving enzymes. A true friend stands the test of time, and aloe (Aloe vera) has been a very good friend for more than 2,000 years. This cherished kitchen remedy for superficial burns, cuts and insect bites is the stuff of legends. Cleopatra had it massaged into her skin, and Napoleon’s Empress Josephine reputedly used it in her complexion milk. Aristotle – coveting a steady supply for Greece in the fourth century B.C. – reported cajoled Alexander the Great to conquer the East African island of Socotra, the only place known at the time where ale was cultivated. Centuries later, it was imported into England from Barbados, and the species named for that island, Aloe barbadensis, is likely the most potent of more than 300 aloe species. If you squeeze an aloe leaf, you’ll notice a pleasant sponginess – that’s from the mesophyll, a water-engorged gel in the inner leaf tissues. While it’s 99 percent water, this mucilaginous gel also contains specialized polysaccharides, amino acids, saponins, vitamins, minerals and enzymes, all of which act together to deliver healing benefits to our skin. The other active medicinal component is the latex from the leaf veins. This latex harbors natural laxatives called anthraquinones. From that spongy leaf flows a plethora of aloe vera products – now more than 1,500 and counting, according to the International Aloe Science Council. Aloe graces the contents of cosmetics, pharmaceuticals, foods and beverages. That aloe vera plant sitting idle on your kitchen windowsill is your best friend the next time you suffer a minor burn. Snip a leaf, coax a little gel onto a minor burn or cut, and relief is almost instant. Salicylates numb the pain with anesthetizing and anti-inflammatory actions. Aloe’s polysaccharides and fatty acids further discourage inflammation. And soapy saponins stifle and flush out bacteria. Then aloe’s amino acids, polysaccharides and enzymes help fashion new connective tissue and regenerate the skin- with little or no scarring. Skin has multiple enemies, such as drying, irritation and formation of age-induced “liver” spots – those blotchy deposits of excess melanin that attend our golden years. Aloe gel impedes the enzyme responsible for those liver spots. The gel also serves as a skin softener. One of the most persistent and uncomfortable skin conditions is eczema, a superficial inflammation of the skin that produces itchy, weeping, crusty blisters. Peter Atherton, author of The Essential Aloe Vera, has tested aloe extensively in his own practice and recommends it for juvenile eczema. He favors aloe cream containing bee propolis, a natural plant-derived sterilizing agent used by bees to line their hives. He also advises a twice-daily application of aloe gel for adult acne rosacea. Aloe gel’s benefits extend beyond the skin, too. Aloe gel may help mouth or stomach ulcers and problems of the bowel lining. Taken in beverage or supplement forms, it helps heal damaged mucosal linings and discourages oversecretion of digestive acids that can aggravate ulcers, according to a 2004 study. However, such benefits are likely to be temporary, lasting only so long as the aloe is taken. One of the most important routes by which aloe protects and heals tissues is through the action of its gel polysaccharides (and perhaps other components), which modulate our immune system. The polysaccharide acemannan, for example, supports maturation of dendritic cells – the policing cells of the immune system that patrol the body to shackle foreign invaders (such as viruses) and shuttle them to the lymph nodes for a quick death. 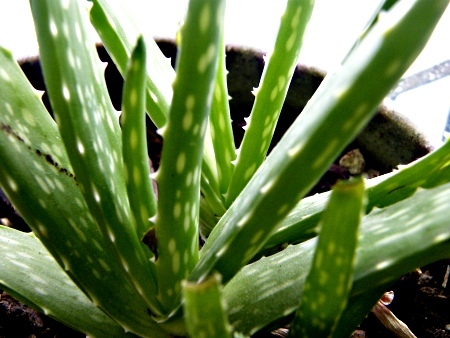 Immunomodulators in aloe vera also can subdue an overactive immune response, which can trigger excessive inflammation. They do so by curbing production of prostaglandins and thromboxances, which cause inflammation. Aloe gel contains well-known anti-inflammatory agents, including the fatty acids lupeol, cholesterol, campestrol and b-sitosterol. Its anti-inflammatory and analgesic effects likely also arise from its influence on the neurotransmission of injury and pain signals from the wound site, an action revealed in research conducted in 1999 at Indiana University’s School of Medicine. Dentistry practically applies aloe’s medicinal benefits. In sedative dressings, for instance, aloe gel is used to ease pain and speed healing after gum or root canal surgery. Aloe also soothes mucous membranes irritated by dentures. And an aloe activator spray has been used for painful erupting wisdom teeth. In the future, we may see a clinical role for aloe in reducing high blood sugar and treating some cancers. A review in Diabetes Care acknowledged aloe as one of several plants known to reduce blood sugar levels, but the mechanism of its action is still being unraveled. Diabetics in the Arabian Peninsula traditionally have eaten aloe gel to control their blood sugar levels. There is also much research on cancer therapies using aloe vera. Its anthraquinone emodin (present in aloe vera and some other plants) coaxes human cancer cells to self-destruct. But New York’s Memorial Sloan-Kettering Cancer Center considers it too early to recommend aloe for human cancers – a reasonable position, since injections of an aloe polysaccharide as a cancer therapy have been implicated in several deaths. Aloe as a topical ointment is generally considered safe, but ongoing internal use – such as with aloe juice or supplements – may pose risks such as stomach upset, nausea, seizures, potassium loss and electrolyte abnormalities. Aloe as a laxative – while used historically by many people for this purpose – has been deemed unsafe by the U.S. Food and Drug Administration, and the first case of acute hepatitis from ingestion of an over-the-counter aloe product was noted recently. Also, aloe vera may intensify the effect of blood thinners, thus inducing excessive blood loss during surgery, for example, according to a 2004 study. So, until we know more, the safest route to using aloe is strictly topical. If you are bent on taking it internally, do so only occasionally, and look for a reputable manufacturer. There are many aloe products, so the question arises as to which ones are best for skin care and healing. The International Aloe Science Council recommends that products containing between 10,000 and 20,000 mucopolysaccharides per liter have the highest therapeutic value. Also, products carrying the IASC Certification Seal assure content, purity and freshness and that the aloe is from a certified source. Once you start heating, extracting, filtering, stabilizing and preserving a biological product – all common steps in product manufacture- there’s the possibility of compromised quality. Whereas, you can pop a potted plant onto your windowsill and have the factory at your fingertips – not to mention the sheer enjoyment of watching it grow. Oregano. While it seasons your Italian dishes, oregano is also a natural anti-microbial agent — protective against viruses, bacteria, fungi, and parasites. Its rich anti-oxidant levels also may help prevent breast and ovarian cancers. Oregano oil acts as an anti-histamine and has cell regeneration properties. Try oregano in marinades, sprinkled over grilled chicken, or combined with garlic, olive oil, and parmesan cheese for a healthy bread dip. Rosemary. This plant has anti-inflammatory properties. In tea form, it can help alleviate headaches and acts as a natural astringent. Research also shows it’s a free-radical fighter that may combat cataracts. 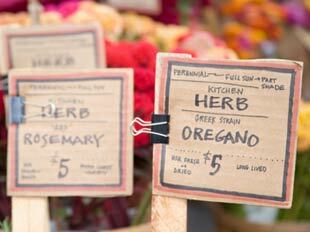 Add rosemary to liven up sauces, or leave in its plant form as an indoor air freshener. Mint. Found often in teas, this cool, crisp leaf soothes rattled nerves and can calm queasy stomachs — with studies suggesting it aids treatment of irritable bowel syndrome. Mint may also help reduce tumor growth. Evidence shows that its potent phytochemicals may work to cut off blood flow that nourishes the tumors. It has external medicinal benefits too. Recent studies found that dousing a cold compress with mint oil and rubbing it over joints can relieve pain and discomfort associated with arthritis. When you think predator, snails probably don’t come to mind. But the venom from a cone snail is so strong it can paralyze a fish in seconds. Now, researchers think a synthetic form of a toxin in the venom may help them conquer pain. Cancer patient, Sallie Williams is testing out the new drug. She says constant pain puts a damper on her lifestyle. A pump, surgically implanted in the abdomen, delivers the drug directly into the spinal cord. The drug paralyzes the nerves that transmit pain to the brain. This type of problem has never been able to be treated by any drug. In fact, the only other alternative was to actually destroy nerves that were involved. Obviously when you destroy nerves, you have a high potential of losing function. Patients and their families hope the new drug can give a one-two knockout punch to pain. Patients with terminal cancer or AIDS are participating in the drug study at 30 medical centers across the country. If the drug proves effective, it could be in widespread use within two years. Ginseng, Ginko, St. John’s Wort. Each year, Americans spend millions of dollars on herbal supplements to treat everything from depression to memory impairment. However, “all natural” doesn’t always mean it’s harmless, especially if you’re about to have surgery. Here’s why supplements and surgery can be a dangerous combination. They beckon us from the store shelves, promising to improve our health, but herbal remedies can have the opposite effect in the operating room. Just ask Bob. He was an hour from having routine knee surgery when a doctor asked him what pills he takes. “I was telling them I was taking my aspirins on a daily basis. I was taking my vitamin E, and I was taking St. John’s Wort,” he says. That was all it took for the doctor to cancel Bob’s surgery. Dr. says combining herbal supplements with surgical medication can be dangerous, especially St. John’s Wort. “You could suddenly be hypertensive. You could have a seizure. Your body temperature could rise up tremendously”. Also on the hit list: memory enhancer ginkgo biloba, which can interfere with blood clotting. Vitality booster ginseng can cause high blood pressure and a rapid heartbeat during surgery. Bob is off supplements until after his re-scheduled surgery and says he plans to learn more about the side effects before he takes them again. The American Society of Anesthesiologists says the biggest problem is 70 percent of supplement users never tell their doctor. Anesthesiologists recommend patients stop taking supplements at least two to three weeks before surgery.